Eliminating trans fats from food seemed to be the ‘big thing’ at the end of the 2000’s and the first part of the 2010’s. And, if you look at most labels, you’d think that we were fairly successful at this. Except you would be wrong. Read on. Trans fats are produced by hydrogenation, which is the process of adding hydrogen to vegetable oil. The reason for doing this is to make the oil last longer. Without hydrogenation, the oil would break down sooner, meaning the products in which it’s contained would not last as long. So, the long and short is that hydrogenation was a pretty standard practice. This didn’t seem like any big deal except when it was discovered that hydrogenation was directly responsible for increased levels of LDL (bad) cholesterol and heart disease. Long story short, trans fats are terrible for you. Once this correlation was discovered and the alarm was sounded, there was a big wave to get rid of them. Cities started banning them in foods. Article after article was written. The FDA even got in on the game and changed product labeling standards so that trans fat contents were disclosed as part of the standard nutrition label. The FDA to the rescue…or not? 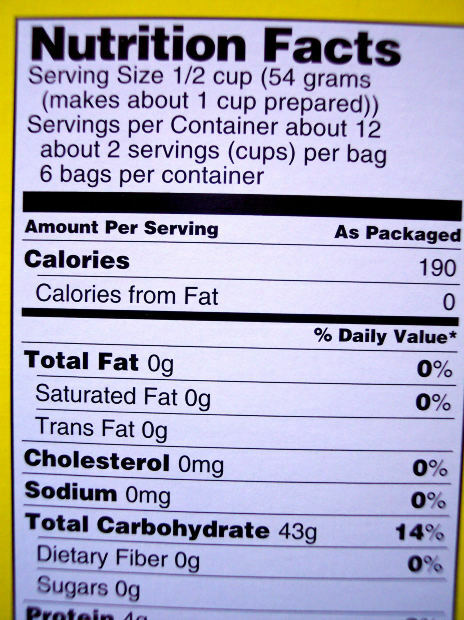 The new labeling went into effect a few years back and made ‘Trans Fat’ one of the items that was required in addition to calories, fat calories, sodium, and other items which are pretty standard. I remember seeing a lot of the new labels and noticing that items contained trans fats. Then, it seemed, one by one, products started getting re-formulated to where the Trans Fat listing was 0g (zero grams). Except in many cases it’s not true. See, the FDA allowed rounding. And, they allow rounding down, so that if a serving of food contains anywhere less than 0.5 grams of trans fat, they can say that it has none. The big deal is that any amount of trans fat is bad. It’s not like you can consume 10 grams per day before it starts being bad. Even a gram or two per day increases the bodies chances of having higher cholesterol and heart disease. Meaning, it doesn’t take long for a few servings of food that each have, say, 0.4 grams of trans fat, to add up into unhealthy levels. All the while, people are eating them, oblivious to the fact that they’re harming their bodies. Right now, you can see through the lies by looking at the ingredients list. If you see anything that contains the word ‘Hydrogenated’ in any form, then there are trans fats in that product, regardless of what it says on the nutrition label. You should probably assume that most fried food contains trans fats as well. Even though many fast food makers ‘eliminated’ trans fats from their fries and other foods, they still contain enough trace amounts that it should be assumed you’re eating them. I believe that the FDA made a big error when they allowed for this loophole, especially given how little it takes for trans fats to cause health problems. Honestly, the only way a product should be allowed to have a 0 g (zero gram) listing is if it contains none at all. If it’s anything less than the 0.5 gram threshold, then it should have to be noted as such. 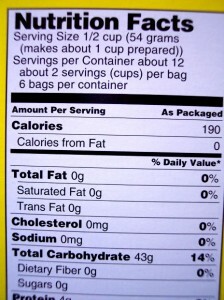 Manufacturers will complain that it’s hard to measure with accuracy at those levels, but even if the label read <0.5 grams (less than 0.5 grams), it still alerts the consumer that there are trans fats in the product. This is important. While I believe that every individual is responsible for their own health and understanding the things that they put into their body, this is so important that I don’t think that the current standards are inadequate for this product. Trans fats are a problem. If they eliminated 90% of the problem but the other 10% is still causing problems, then the labeling should not allow the 10% remaining to stay in existence. I’m making up those numbers, but I hope I’m also making my point. Readers, do you look beyond the Trans Fat listing on the nutrition labels and into the ingredients list to get the true reading? Did you know that this loophole is out there? You can count on the fast food industry to constantly look for loopholes in their product label information in order to appear ‘healthy’. The FDA should enforce that the term ‘less than 0.5 grams” is printed on the label information. If there are trace amounts of trans fats in the product, then saying that 0 g of trans fats are in the product is just a lie. While it’s true that each individual is responsible for their own health, it’s also true that the FDA’s mission should be to protect the public. Trace amounts over time add up to unhealthy levels for the consumer. When I go to the supermarket, I don’t see the majority of shoppers reading the label information in the products. Most people get distracted by the sales and focus on the product prices. I think each person needs to make it a priority to take the time to scan the labels (especially the ingredients list) for those items that are hidden, descriptions such as “hydrogenated”, that can pose a threat to one’s health and well being. Taking those extra few minutes to scan the labels while your shopping definitely makes pays off in the end. I have been more aware of it since I started finding more about the information that went into this post, and I STILL probably only look a quarter of the time. I definitely didn’t know that loophole existed, but truthfully it doesn’t surprise me. I’m sure there’s all kinds of bad things in the foods we eat. I’m trying to eat more whole foods so that I know exactly what I’m “getting”. Particularly more fruits and veggies and whole grains that aren’t processed. Now that you know, if you look for it, you will be unpleasantly surprised at how common it is. I’m with KK – not surprised such a loophole existed. It’s terrible that the agribusiness/food industry has so much control within the government and can influence them to make laws and policies in their favor, instead of the consumer’s.. but thankfully with the Internet there’s a wealth of easy to access information for consumers – just like this post! – so we can educate ourselves. I try to limit my trans fats, but it is almost impossible! I try to eat well and eat more raw or healthy food because I know I cannot cut everything out. I think it is the only sensible approach to it anyway. I too have heard of this loophole, and feel the same way as you do in that it could potentially be misleading for people. It’s good to read the ingredients list and not just look at the nutrition label. Even if something looks like it has a pretty harmless nutritional profile based on the data, it still might have some less than healthy ingredients. I’ve been getting much more attuned to nutrition lately, and it’s interesting how much even well-meaning people might miss. I didn’t know that they allowed rounding, but I’m not too surprised they made this loophole. Generally anything processed is going to have bad stuff in it. It’s hard to avoid processed foods all together, but I’m trying to eat more fresh raw foods whenever I can.